Originally built in 1895 and designed by the local architect J.M. 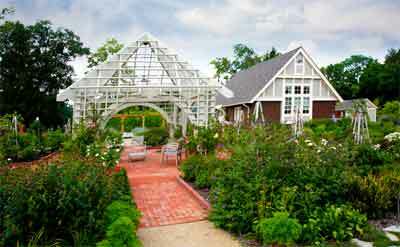 Freese, the Franklin Park Conservatory is on the National Register of Historic Places. Today, it is a premier horticultural and educational institution showcasing exotic plant collections, special exhibitions, the spectacular Chihuly artworks of glass, and the James Turrell permanent lighting exhibit of the John F. Wolfe Palm House. The conservatory contains more than 400 plant species including collections of: Himalayan Mountains, Tropical Rainforest, Desert, Succulent Patio, Bonsai Courtyard, Pacific Island Water Garden, Showhouse with orchid and tropical bonsai collections, and Palm House with more than 40 species of palms. The conservatory is set within Franklin Park on East Broad Street, and surrounded by 90 acres of outdoor botanical gardens and green space. A single glance at the original Victorian glass palm house leaves no doubt that Franklin Park Conservatory has a rich and significant history to tell. It all began when the Franklin County Agriculture Society purchased 88 acres of land two miles east of downtown Columbus to host the first Franklin County Fair in 1852. By 1874, the Franklin County Agricultural Society agreed on the importance of this piece of land by increasing the size to 93 acres, and made it the official site of the Ohio State Fair. For several years, the state fairgrounds were a popular destination for visitors from around the state. On August 11, 1880, history was made when General William Tecumseh Sherman delivered his famous statement, “War is Hell,” in a speech to Civil War veterans gathered at Franklin Park. The state fair occupied the site until 1884, when it moved to a new location just north of Columbus' city limits. With that change, the park was abandoned of any formal events. But on May 17, 1886, the site was officially revived when the Ohio State Legislature passed a resolution declaring it open for use as a public park. In 1893, the Chicago Columbian Floral Exhibition was held and it was then decided that a similar exhibition hall could be built in Columbus. The Palm House was opened in 1895 and today is the oldest part of the conservatory, and the most distinctive. It has been revitalized several times throughout its long history and today it is the focal point of the park and the conservatory. The Victorian structure still maintains its original charm and still houses one of the original trees planted when the building first opened: a fiddle-leaf fig tree that is still thriving. 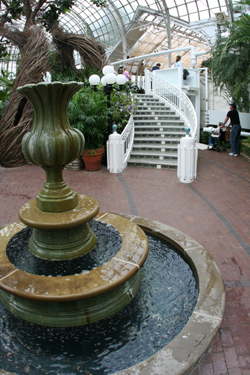 The Palm House (recently renamed the John F. Wolfe Palm House) is also a popular location for numerous weddings and other special events held at the conservatory throughout the year. Besides the Palm House, there are numerous other venues used for event planners including both interior and exterior locations surrounding the Palm House that offers guests an incredible atmosphere rich in history and beauty. In 1992, the world took notice of Franklin Park and the Conservatory when Columbus hosted the quincentennial of Christopher Columbus arriving on the shores of the new world in 1492. Franklin Park was transformed into AmeriFlora, an international horticultural exhibition that filled the parks 88 acres. AmeriFlora lasted from April 3, 1992 to October 12, 1992. Franklin Park Conservatory is the only public botanical garden in the world to own a signature collection of Dale Chihuly’s glass artworks. 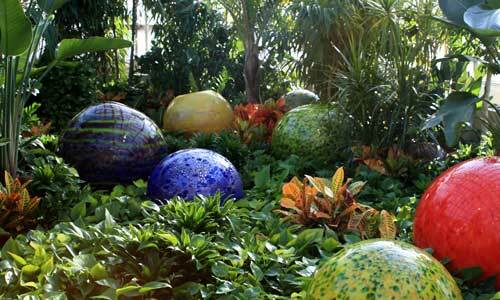 In the fall of 2009, additional new pieces of Chihuly's artwork went on display at the conservatory. In August 2008, a new computer controlled LED lighting installation was turned on to rave reviews. 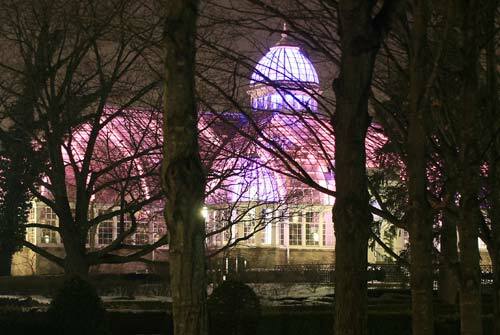 Created by the renowned artist James Turrell, the slowly changing lights morph through a rainbow of colors that emphasize the Victorian architecture of the John F. Wolf Palm House. The light sculpture called "Light Raiment" operates from dusk to dawn every day throughout the year. The 7000 LEDs, while not unique in themselves, are unique in this situation. It was reported when the lights were first turned on, that this was only the second such lighting display in the world and the only one like it in the United States. The Scotts Miracle-Gro Company Community Garden Campus is now open. Located on the southeast corner of Franklin Park, the garden campus has become the premier resource and education center for community gardeners, but don't let the name fool you. Even those that have no intentions of participating in a community garden will find ideas and tips for their own little plot of land, and for those looking for a delightful stroll through managed garden spaces will find plenty of opportunities and vistas in the new center. Ample free parking is available. 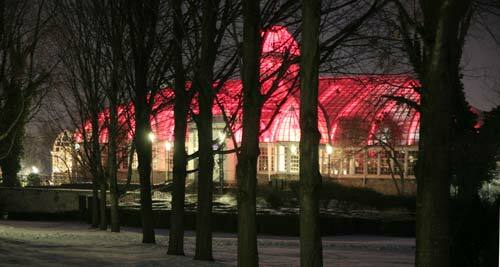 There is no charge to view the exterior lighting, however there is a small entrance fee to the conservatory. Memberships are also available. The lighting exhibit runs from sundown to sunup daily. The lighting scheme takes just over an hour to run through a complete cycle which then repeats. Amid a spectacular showcase of tropical flowers and foliage, the 13th annual Blooms & Butterflies exhibition transforms the Conservatory into an enchanting butterfly haven. Enjoy a closer look at these fascinating creatures through hands-on, larger-than-life activities in the new Butterfly Discovery Center! 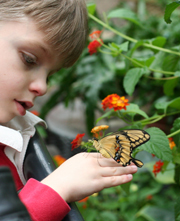 And learn even more during guided Butterfly Releases at 1 and 3 p.m. daily.